The Roseland Ballroom was a multipurpose hall, in a converted ice skating rink, with a colorful ballroom dancing pedigree, in New York City's theater district, on West 52nd Street in Manhattan. The venue, according to its website, accommodated 3,200 standing (with an additional 300 upstairs), 2,500 for a dance party, between 1,300 and 1,500 in theatre style, 800-1,000 for a sit-down dinner, and 1,500 for a buffet and dancing. The venue hosted a wide range of events, from a Hillary Clinton birthday party, to annual gay circuit parties, to movie premieres, to musical performances of all genres, including Beyoncé's Elements of 4 show and internet stars Team StarKid's Apocalyptour National Concert Tour. It was also known as the place American singer Fiona Apple broke down during a concert in 2000. The rear of the venue faced West 53rd Street and the Ed Sullivan Theater. On October 18, 2013, it was announced that the venue would close on April 7, 2014. Lady Gaga completed a short residency as the last performer before the Roseland Ballroom closed. Roseland was founded initially in Philadelphia, Pennsylvania in 1917 by Louis Brecker with financing by Frank Yuengling of the D. G. Yuengling & Son beer family. In 1919, to escape Philadelphia's blue laws, Brecker and Yuengling moved the venue to 1658 Broadway at 51st Street in Manhattan, on the second floor of that five-story building, opening on December 31, 1919. It was a "whites only" dance club called the "home of refined dancing", famed for the "society orchestra" groups that played there, starting with Sam Lanin and his Ipana Troubadours. The all-white, ballroom-dancing atmosphere of the club gradually changed with the ascendance in popularity of hot jazz, as played by African American bands on the New York nightclub scene. Piron's New Orleans Jazz Orchestra played the ballroom in 1924. The Fletcher Henderson band played at Roseland in the 1920s and 1930s. Louis Armstrong, Count Basie (with his "Roseland Shuffle"), and Chick Webb followed with their orchestras. Other major-name bandleaders who played the venue included Vincent Lopez, Harry James, Tommy Dorsey, and Glenn Miller. Many big-band performances were broadcast live from Roseland by radio networks; recordings survive of several NBC broadcasts of 1940, featuring the young Ella Fitzgerald fronting the Chick Webb band. Brecker popularized marathon dancing until it was banned, staged female prizefights, yo-yo exhibitions, sneezing contests, and dozens of highly publicized jazz weddings with couples who met at the club. As the club grew older, Brecker attempted to formalize the dancing more by having hostesses dance for 11¢ a dance or $1.50 a half-hour, with tuxedoed bouncers (politely known as "housemen") keeping order. It was to work its way into stories by Ring Lardner, Sherwood Anderson, F. Scott Fitzgerald, and John O'Hara, as well as a Doonesbury (by Garry Trudeau) storyline featuring Alice Schwarzman and Phil Slackmeyer. The original New York Roseland was torn down in 1956 and it moved to its new venue on West 52nd, a building that Brecker earlier had converted from an ice-skating rink to a roller-skating rink. It had been built in 1922 at a cost of $800,000 by the Iceland ice-skating franchise. A thousand skaters showed up on opening night at the 80-by-200-foot rink on November 29, 1922. Iceland went bankrupt in 1932 and the rink opened as the Gay Blades Ice Rink. Brecker took it over in the 1950s and converted it to roller-skating. Time magazine described the new Roseland's opening interior as a "purple-and-cerise tentlike décor that creates a definite harem effect." Brecker attempted to maintain its ballroom dancing style, banning rock and roll and disco. In 1974 Brecker told The New York Times, "Cheek-to-cheek dancing, that's what this place is all about." Brecker sold the building in 1981 to Albert Ginsberg. Under the new owners the Roseland began regularly scheduled "disco nights", which gave rise to a period when it was considered a dangerous venue and neighborhood menace. In 1984, a teenager was shot to death on the dance floor. In 1990, after Utah tourist Brian Watkins was killed in the subway, four of the eight suspects (members of the FTS gang) were found partying at Roseland. 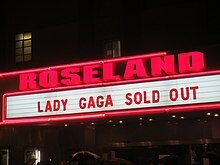 As a result, Roseland discontinued the "disco nights". Its low-rise three-story structure on top of the quarter-acre dance floor in the middle of midtown Manhattan has stirred concerns over its being torn down for redevelopment. In 1996, a new owner, Laurence Ginsberg, filed plans to tear down the venue and replace it with a 42-story, 459-unit apartment building. A spokesman for Ginsberg said the filing was to "beat a deadline for new, more stringent earthquake codes, which went into effect earlier" in 1996. The interior space has been subsequently renovated. The site is being developed into a 62-story mixed-use tower. In November 2013, it was announced that Lady Gaga would headline six shows (March 28, 30, 31 and April 2, 4 and 6), which would be the final performances at the venue. A seventh show was added, held on April 7, 2014, which officially closed the venue. "G.U.Y." was the final song performed at Roseland Ballroom. Malcolm X directed by Spike Lee has a dance scene at the ballroom. Roseland, directed by James Ivory and starring Christopher Walken. Meltdown, a bootleg of the Nirvana performance at the New Music Seminar on July 23, 1993. Phish performed at the Roseland on May 23, 2000, for taping of VH1's Hard Rock Live that first aired July 1, 2000. Roseland Ballroom 2003, a bootleg recording of a 2003 AC/DC concert. Honda Civic Tour presents: Panic! At The Disco on May 8, 2008. Madonna: Hard Candy Promo Tour - filmed for MSN online broadcast on April 30, 2008. Beyoncé held a revue show titled 4 Intimate Nights with Beyoncé on August 14, 16, 18 and 19, 2011. The first show sold out in 22 seconds, and the remaining three performances in the following minute. A DVD of the show titled, Live at Roseland: Elements of 4, was released on November 21, 2011. Steve Aoki: Deadmeat Live at Roseland Ballroom was recorded in 2012. Nicki Minaj held a free concert for her last U.S. date from her Pink Friday Tour August 14, 2012, which was streamed by Pepsi at Roseland. Lady Gaga Live at Roseland Ballroom - filmed for Verizon Wireless online broadcast on April 7, 2014, the last day of Lady Gaga's residency concert and also the closing date of Roseland. In A Chorus Line, the character of Al DeLuca sings about how his father would take his mother to the Roseland Ballroom in the song Montage 3: Mother. ^ "Live Nation Ticketing In Deal With Roseland". Billboard. October 14, 2008. Retrieved 2014-04-13. ^ "Roseland Ballroom: Floor Plans". Roselandballroom.com. Archived from the original on 2013-04-16. Retrieved 2013-05-11. ^ "Fiona Apple Breaks Down At NYC Concert". Billboard. March 1, 2000. Archived from the original on March 6, 2012. ^ Rahman, Ray (June 19, 2012). "Fiona Apple tells Jimmy Fallon about famous meltdown". Entertainment Weekly. Retrieved 2013-05-11. ^ "Lady Gaga To Close NYC's Roseland Ballroom". Live For Live Music. November 20, 2013. Retrieved 2014-05-20. ^ a b "The History of Roseland". RoselandBallroom.com. Archived from the original on October 5, 1999. ^ Krebs, Albin; Thomas, Robert McG., Jr. (October 27, 1981). "Notes on People; It's On With the Dance". The New York Times. Retrieved 2014-03-23. ^ "18-Year-Old Is Killed In Roseland Ballroom". The New York Times. November 11, 1984. Retrieved 2014-04-13. A Staten Island teen-ager was fatally shot yesterday morning at the Roseland ballroom in midtown Manhattan, the police said. The victim - Robert Dudley, 18 years old, of 62 Roxbury Street - was shot once in the chest at 3:26 A.M. and was pronounced dead on arrival at St. Clare's Hospital and Medical Center. The police said they had not established a motive for the slaying. ^ "Discoterror". Scientitian.com. Retrieved 2013-05-11. ^ Gray, Christopher (October 13, 1996). "An Old-Fashioned Dance to the Music of Time". New York Times. Retrieved 2014-04-13. ^ "239 West 52nd Street". New York YIMBY. Retrieved 2017-02-18. ^ McManus, Brian (November 19, 2013). "Lady Gaga Concerts to Close New York's Famed Roseland Ballroom". The Village Voice. Archived from the original on October 27, 2014. Retrieved 2013-11-19. ^ "Steve Aoki: Deadmeat Live at Roseland Ballroom". Amazon.com. Retrieved 2014-04-13. Wikimedia Commons has media related to Roseland Ballroom. Official website Archived from the original on January 25, 1999. Additional archive on January 17, 2008. Hayes, Dade (March 21, 2014). "IFC's 'Up! Up! Upfront!' Rolls Curtain Down on Roseland Ballroom". Broadcasting & Cable. NewBay Media. Retrieved 2014-03-23.